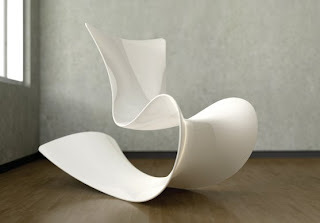 I haven’t spent much time posting about furniture design, but this chair was too beautiful to ignore. Industrial designer Patrick Messier created this rocking chair to look like a ribbon suspended in space, and is made from a single piece of fiberglass with a high gloss urethane finish. If you like the design, you might want to save your pennies, as the price tag runs about 6K.